Figure 13. The effects of lung volume on twitch pressure. Shown is the marked decrease in the amplitude of transdiaphragmatic pressure (Pdi,tw) during an acute inflation from functional residual capacity to total lung capacity, both in normal volunteers (solid circles) and in patients with preexisting hyperinflation impairing baseline diaphragm efficacy (open circles). This reduction in Pdi with volume is mainly due to a reduction in the esoph-ageal pressure (Pes) component of the twitch, which becomes very close to zero at TLC in normal subjects. mal it completely suppresses the twitch (150-153) (Figure 14). It is usual to compare the amplitude of the interpolated twitch with that of the fully potentiated twitch performed on the relaxed muscle. Normal subjects can voluntarily produce maximal diaphragmatic contraction during inspiratory and expiratory efforts as judged by twitch occlusion (56, 154, 155), as can patients with COPD (131). However, interpolation can be complicated by the effects of series compliance on twitch height (156). The y intercept (a) of Equation 1 closely matches the value of Pdi,tw obtained at relaxed FRC, and its x intercept closely matches Pdi,max. The a/b ratio corresponds to the diaphragm twitch-to-tetanus ratio, which is 0.20-0.25 in most studies, close to the twitch-to-tetanus ratio of skeletal muscles in mammals (157), giving credibility to the technique. 1. Assess the degree of central activation associated with voluntary diaphragm contraction (88, 158). 2. Discriminate between the central and peripheral components of diaphragm fatigue or weakness (88, 159, 160) (see Types of Fatigue in Section 5 of this Statement). Figure 14. Twitch occlusion technique. Top: Procedure that can be used to study the effects of a voluntary diaphragmatic contraction (Pdi,vol) on the response to phrenic nerve stimulation (Pdi,tw). Pdi is displayed on an oscilloscope visible to the subject and the operator. The subject is asked to perform stepwise graded contractions, guided by the Pdi trace, and to sustain several levels of Pdi for a few seconds. The operator superimposes one or more stimulations during each sustained contraction. Bottom: two examples of twitch occlusion procedures. In both cases, Pdi,tw decreases linearly with Pdi,vol, according to Pdi,tw = a - b Pdi,vol. The left panel illustrates a subject capable of maximally activating the diaphragm: the subject can produce a voluntary contraction that is associated with complete absence of Pdi,tw. 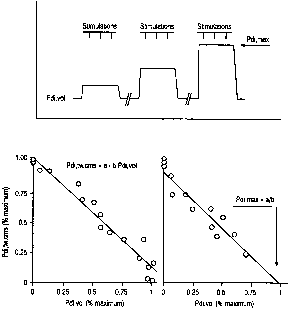 The right panel illustrates a subject not capable of maximal contraction: Pdi,max can be estimated by extrapolating the Pdi,tw-Pdi,vol relationship to the x axis, and is equal to the ratio of the intercept of this relationship to its slope (Pdi,max = a/b, arrow). 4. Estimate Pdi,max from submaximal efforts (56). Methodology. The technique by which bilateral supramaximal PNS is to be performed should be that established for ES (56, 88, 120, 131, 154, 155, 160, 161, 163-167) or CMS (108). A visual feedback of Pdi is provided to the subject and the operator on an oscilloscope or computer screen. A standard procedure is as follows. First, Pdi,max is determined. Then, the subject is asked to produce, in a stepwise manner, fractions of Pdi,max previously marked on the screen of the oscilloscope. While a given step is briefly sustained, one or a few stimuli are delivered so that data for Equation 1 can be built up. To assess the degree of central activation a single stimulus over any in-spiratory effort followed by a stimulus in relaxed condition may be sufficient (88). Advantages. Twitch occlusion allows an investigator to separate central from peripheral weakness or fatigue of the diaphragm (80). Disadvantages. The twitch occlusion technique is restricted by the difficulties inherent in ES and Pdi measurement. The consistency of the stimulus delivered to the nerves becomes increasingly difficult to maintain as neck muscles are recruited during intense inspiratory maneuvers, although CMS (109) or Pmo (120) could help. When graded voluntary Pdi maneuvers are performed, neck muscles often stay relaxed during low-intensity diaphragm contractions, but are coactivated during high-intensity contractions (70% of Pdi,max and above) (56), which may decrease rib cage distortability. During twitch occlusion from relaxed conditions to maximal effort, diaphragm contraction will interact with a distortable rib cage at low Pdi,vol values, and with a much stiffer rib cage at high Pdi,vol values, complicating the results. This problem may disappear with CMS, because it tends to stabilize the upper rib cage at all levels of Pdi,vol (109). The impact of twitch potentiation on the twitch occlusion procedure is not known. Theoretically, potentiation of Pdi,tw would lead to an underestimate of the central component. Force-frequency curves. When stimulation frequency increases, the mechanical output of the stimulated muscle increases up to a plateau (tetanic contraction). Force-frequency curves contain much information about skeletal muscle contractility, and reflect the type and severity of muscle fatigue.